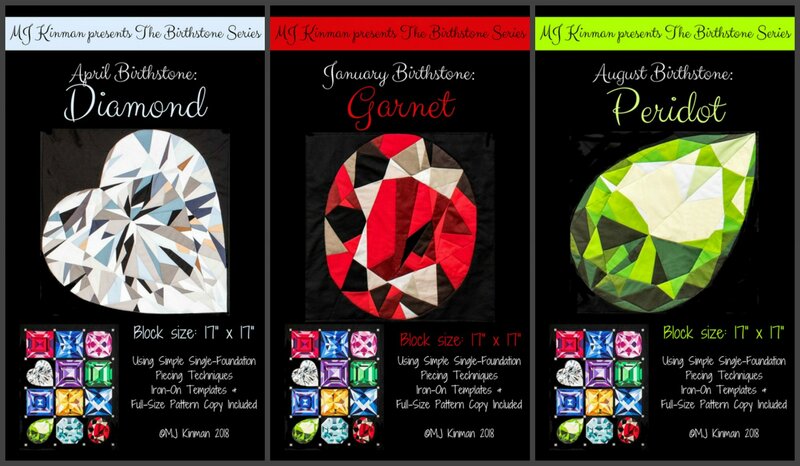 We are pleased to announce a new workshop series for 2019 called Gemstone Gallery featuring MJ Kinman's Birthstone Series (shown above), which includes twelve larger than life birthstone gems. Each gem makes a 17" block that can be sewn together to make the Birthstone Series quilt (63" x 84"). You can also pair several together to make a wall hanging or table runner, or each can stand alone as a small art quilt - a beautiful piece of textile art. In this, the fourth of the four workshops, we will be featuring the Diamond, Garnet and Peridot. You choose which one you want to make. A supply list will be given at time of registration. NOTE: If you register for all four workshops at once prior to April 13, 2019, you will receive a discount of 20% off the workshop fees (save $60). If you want to take advantage of this option, please call the shop at 502-261-7377.